Chief Executive Officer of the Guyana Telephone and Telegraph Company, Justin Nedd. The Guyana Telephone and Telegraph (GTT) has assured investors in the oil and gas sector that the country is unlikely to experience disruptions to international connectivity with the rest of the world because the submarine fibre-optic cable has a back-up system. 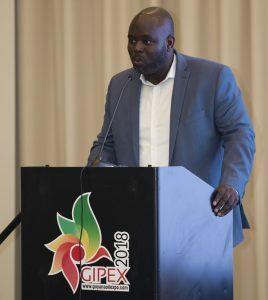 Delivering a presentation at the recently concluded GIPEX 2018 Oil and Gas conference and exhibition, GTT’s, Chief Executive Officer Mr. Justin Nedd said the submarine cable, built in 2010, currently carries 100% of the nation’s business and private communications traffic that legally transits the nation’s borders, with plenty of additional capacity to spare. “Since its inception, GTT has continued to invest in the cable to expand its initial capacity 50-fold (5000%), and is committed to continuing to invest in and expand cable capacity to accommodate the nation’s growing communications traffic. Through access to other subsea and terrestrial cable holdings and partnerships, GTT also provides the diverse redundant fibre paths that ensure always-on connectivity,” said Nedd. Nedd highlighted that GTT has pioneered many firsts in Guyana: the modernization of basic telecommunications, the nationwide launch of cellular services, the first high speed broadband network, the deployment of LTE-based fixed wireless services, and the submarine cable that serves as the lifeblood of Internet connectivity for the country. Additionally, in 2017, GTT launched the nation’s first fibre-to-the-home network, adding to the advanced and secure fibre-based services that GTT has been providing to businesses for years. GTT says it has invested more that US$150 million in developing communications infrastructure and advanced communications & information services in the last 10 years alone. GTT says, in recognition of the ongoing technical and investment leadership of GTT in the Guyanese information & communications technology sector, as well as the company’s extensive philanthropic investment program, GTT was awarded the 2017 “Large Business of the Year” honor by the Georgetown Chamber of Commerce & Industry. GTT also received the 2017 “Corporate Citizenship Award of the Year” for the “Pinktober” initiative, which raised over GY$4 million to help raise Breast Cancer Awareness in association with the Guyana Cancer Foundation. GTT was a Platinum sponsor at GIPEX, a decision the company says was based on its enthusiasm for the important work that the oil & gas companies are doing in Guyana that will hopefully be a catalystfor the growth of the country and improvement in the daily lives of our citizens. “As the oil & gas industry deploys its financial, technical and business resources for the important tasks that lay ahead, know that there is a reliable partner in GTT who is also ready to invest alongside of you to ensure your success. You have our commitment to Do More in serving as the preferred local communications and information technology partner to the oil & gas industry,” Nedd told those gathered.